A worker loads a tire at the Bridgestone Americas plant in Aiken County, S.C. The recently expanded plant , now 2.42 million square feet, can produce 37,750 tires per day. GRANITEVILLE, S.C.—Bridgestone Americas has initiated serial production of passenger and light truck tires at the expanded portion of its Aiken County tire plant in Graniteville, where the company invested $346 million over 20 months to expand capacity 50 percent. The expansion—to 37,750 tires a day—created nearly 300 full-time jobs at the factory, where hourly employment now stands at more than 1,200. The 20-month project involved expanding the 15-year-old plant's floor space 44 percent to 2.42 million square feet. The first tire out of the presses in the plant's expanded area was a Firestone Transforce HT, according to video footage of the ceremony marking the event. This expanded capacity is intended to help Bridgestone meet growing demand in key market segments, including UHP and light truck/SUV tires, the company said. The addition of more advanced tire building machines provides greater flexibility and speed in responding to shifts in market demand and should aid the company's fill rates, according to Bridgestone. The addition of more advanced tire building machines provides greater flexibility and speed in responding to shifts in market demand, Bridgestone said, which in turn should help the company improve fill rates of these tires. The project now completed comprises two separate expansion announcements. 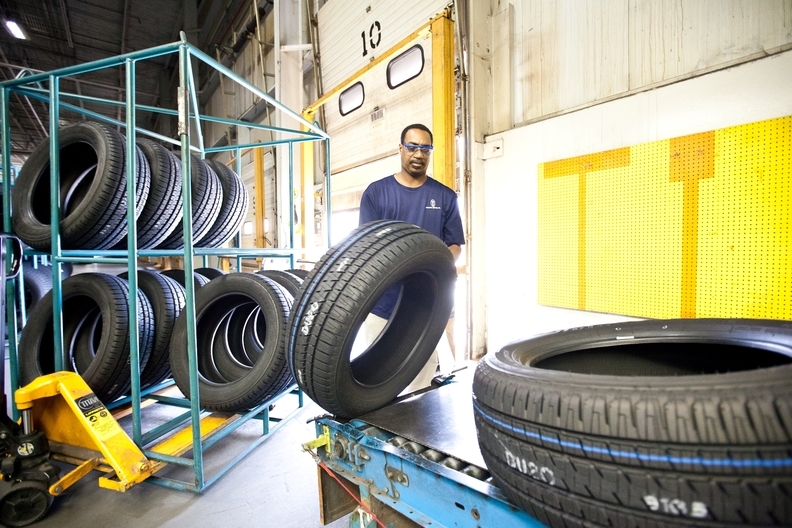 In July 2011, the company announced a $135 million investment to raise daily capacity by 4,750 tires and followed that two months later with an additional $211 million expenditure to boost daily capacity by 8,000 tires more. The Aiken County facility earned LEED (Leadership in Energy and Environmental Design) Silver Certification from the U.S. Green Building Council in 2009, one of only two tire plants in the U.S. to have achieved this distinction. The plant also has been recognized as a Voluntary Protection Program Star site, the Occupational Safety and Health Administration's highest honor. It is awarded to plants that have excellent safety and health management systems and injury rates that are below the industry's national average.